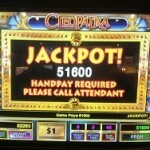 I wanted to share an experience I had playing Cleopatra slot machines. On Oct 31st 2012 my husband and I went to a casino located about 170 km away and decided to stay at the hotel. 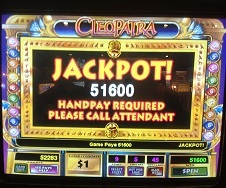 While my husband was watching movies I decided to play my favorite slots game which was Cleopatra. The casino has several of these machines but the one I first played is one that I have had pretty good luck with. 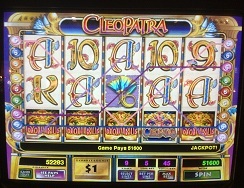 Well that night I had no luck playing so I moved to another Cleo machine, which was much nicer to me. After a short period of time I was hitting a few jackpots. So I continued to play and of course the machine went from hot to cold, however I was also playing the used cars game next to it and that one was doing pretty good. After a while I was hitting jackpots on both machines. With one jackpot win of 9600.00, this was pretty exciting. Anyone who has ever played Cleopatra Slots, know that hitting the 5 beetles is a very good win but hitting the 5 Cleopatra’s seems impossible. Of course getting the free spins and re-triggers is one of the best parts of the whole game. The 9600 jackpot was won on free spins by hitting a five of a kind on the flowers. Due to the fact I was up on the game I was betting a bit larger than normal. I tend to increase my bet based on how much I am up and if the games seem to be paying. So my bet was $27 a spin. It never fails when you’re hitting jackpots you end up having a crowd around you watching your play. This is not something I really like, even though they really mean nothing bad by it. By the end of the night I was up 18k and I was pretty happy to have such as good night playing at the casino. The next day I shared my win with my husband and of course he was happy. I gave him 15k of my wins to hold and while he was in the shower I told him I was going to go down and play for a little bit. Instead of playing the machine I had done well on the night before I decided to play my favorite machine to see if it would payout that morning. Since I was up and had more money to play with I started my bet at $27 a spin and after a short time I was up over a $1000 in credits and this is when I got brave and raised my bet to $45 a spin. I spun the reel a couple times and I watched as 3, then 4 then 5 Cleopatra’s lined on for a jackpot of 51k. Now I had never seen this before and sometimes wondered if it was even possible but there it was. I had won the biggest jackpot the game pays out. The attendants came over to process the jackpot win and I asked if I could take a picture of my win, they said sure. So I told them I needed to go to my hotel room and get my iPad which was fine with them. I went to the room; my husband was just getting out of the shower and looked at me “like what you doing”. I told him I just hit 51k on the Cleopatra Slots game and came up to get my iPad so I could take a picture. He was in shock; I don’t think he actually believed it until he had the 51k check in his hand. 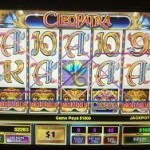 Since many have never seen the major jackpot on Cleopatra I want to share the picture of the actual win. I had only played the machine for about 10 minutes before winning. I definitely was exciting winning that much money but I think just the thrill of actually hitting five Cleopatra’s was the best.